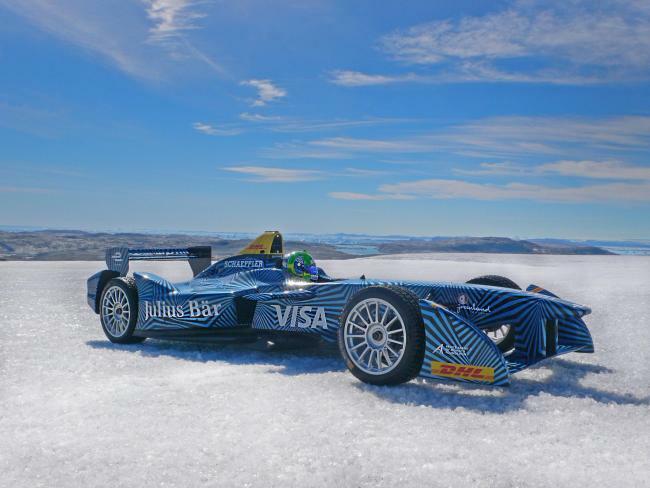 Lucas Di Grassi drove a zero-emission race car across an area of northern Greenland to attract attention to the amount of sea ice breaking away from the Arctic, which has reached historic new levels (September 2016) and take this opportunity to also promote the use of electric cars! It is reported in several newspapers that Formula E CEO Alejandro Agag added: “I have four children and the future of the planet depends on how we can control the effect that human life is having on the environment and the climate. That is why I think climate change is very important to address, to control, to face, and everyone can do something. “… The world’s only fully electric racing series has once again broken new ground by running its car on the Arctic ice cap. With the earth experiencing the warmest year on record, the amount of sea ice breaking away from the Arctic has reached historic new levels. To raise awareness of this crucial and pressing issue, Formula E joined forces with Julius Baer, Visa, DHL, Schaeffler Group, The Prince Albert Foundation II and Mumm to bring this spectacular event to life. The zero-emission racer was driven on the ice cap by adventurous race-winning Formula E driver, Lucas Di Grassi. The Brazilian, who will be seeking to go one better than his runner-up position in the season two championship when the series returns with the HKT Hong Kong ePrix on October 9, performed a series of jaw-dropping runs on the ice cap, inside the Arctic circle in the north of Greenland… more info >>“.